The jokes in “King of Jazz” (1930) aren't particularly funny and not every song swings, but this everything-and-the-kitchen-sink musical revue has one thing going for it: it never lets up, not for a second, not for a single beat. Actually, it's got at least one other thing going for it in bandleader Paul Whiteman, the titular monarch whose reign over the American musical scene began in the 1920s and extended through much of the Depression era. A megastar in his day, Whiteman was known as much for his hefty Oliver Hardy-like physique (which he gleefully poked fun at) as his ornate symphonic arrangements, and this Universal project, produced by Carl Laemmle, Jr., was built entirely around his famous persona. Eschewing any semblance of narrative, “King of Jazz” is structured as Whiteman's scrap book, sometimes literally as the pages of a giant book are turned on stage to introduce the next number. The film rockets through dozens of varied routines ranging from quick comedy bits (most of which were ancient in their day) to vocal trios like The Rhythm Boys (featuring a young crooner named Bing Crosby) to elaborate song-and-dance routines featuring dozens of performers. The most ambitiously and audaciously choreographed sequences helped to establish Hollywood musical standards later expanded on by Busby Berkeley and others. Inevitably, the bits vary wildly in quality, but both the hits and the duds celebrate the power of sheer chutzpah, and showcase a kaleidoscopic array of special effects. 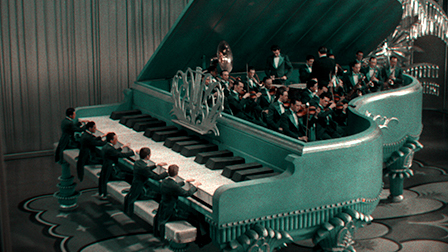 Whiteman's orchestra appears in miniature on a table top at one point, then crammed inside a giant piano. Double-exposed images are super-imposed over the numbers at times, and one singer's face is quadrupled in a proto-psychedelic shot. The greatest effect of all may be the early two-strip Technicolor, restored for this edition in all its gaudy glory. No, check that. The greatest effects are still the performers themselves, especially a few of the more supernaturally flexible dancers. In “Ragamuffin Romeo,” dancer Marion Stadler is flung and spun into a series of seemingly impossible contortions, while in “Happy Feet” Al Norman shows everybody exactly how he earned the nickname “Rubber Legs.” A rousing rendition of “Rhapsody in Blue” (which Whiteman commissioned George Gershwin to compose for him in 1924) blows off the roof too. I'll admit that the film's over-over-the-top grand finale, a “Melting Pot” routine that consumes the final fifteen minutes or so, leaves me cold, but it sure as heck isn't for lack of trying. The glaring problem with the film is that nary a black musician appears in this alleged kingdom of jazz, prompting the question “King, eh? Very nice. And how'd you get that?” A few of the experts who speak in the extras on this disc note this troubling element, and also point out that Whiteman wante to integrate his band and did employ African-American composers backstage. That doesn't change the fact that the film presents us with the absurd prospect of a supposedly comprehensive jazz revue that doesn't acknowledge the bulk of jazz history or its most prominent performers and pioneers. “King of Jazz” followed on the heels of several uninspired Hollywood music revues and flopped at the box office, but it has since become a favorite of early music buffs and was added to the National Film Registry's archive in 2013. 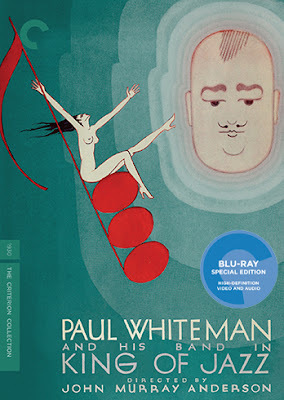 Since then, it has received an extensive restoration that led ultimately to this expansive Criterion Blu-ray release. 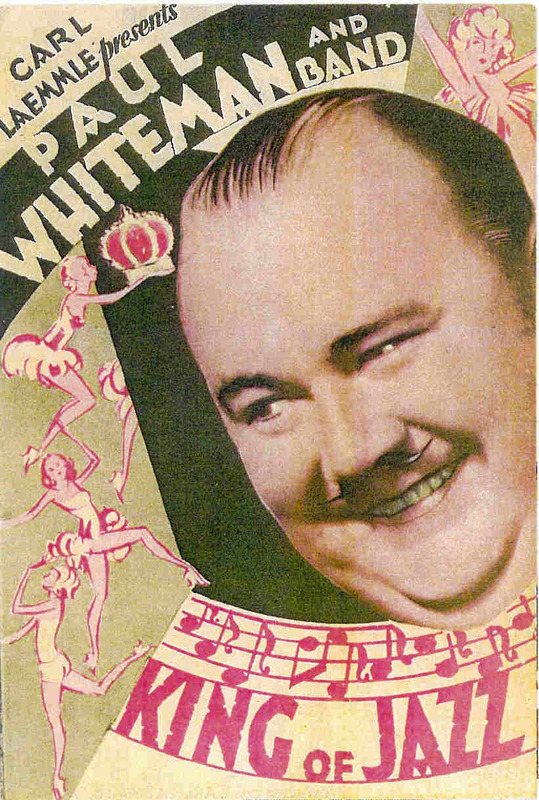 Viewers might not be convinced that Paul Whiteman merited the title “King of Jazz,” but there's little doubt that he (and director/Broadway producer John Murray Anderson among many others) knew how to put on one heck of a show. The film is presented in its original 1.37:1 aspect ratio. 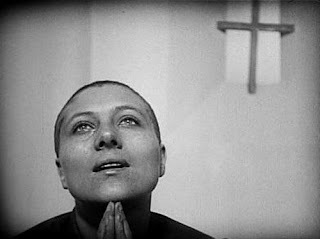 This 4K restoration was undertaken by Universal Pictures and based on the film's initial 1930 release. Surely much of the labor involved restoring the two-strip Technicolor to its original state which is something to behold – the colors don't look naturalistic and sometimes bleed out into the frame, and it's all quite beautiful. Image quality varies a bit throughout and there are a few missing frames here and there (the film is presented “in the most complete form possible”), but the final high-resolution product has a luminous quality that should satisfy everyone. The film is presented with a linear PCM mono audio mix. I swear I thought I was listening to surround sound at times. This music might sound a bit tinny at times, but the mix has a full, vibrant quality to it that more than does justice to the eclectic musical selections. Optional English subtitles support the English audio. Criterion has absolutely stacked this Blu-ray disc with an array of features sure to please music aficionados. The film is accompanied by a commentary track by jazz/film critic Gary Giddins, music and cultural critic Gene Seymour, and musician and bandleader Vince Giordano. 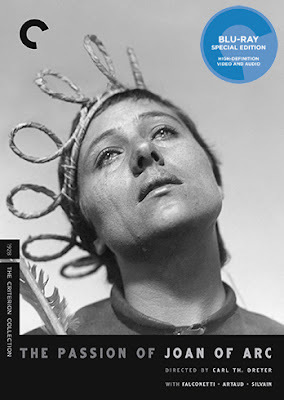 Criterion has also included two new interviews. In the first, Gary Giddins (17 min.) discusses Whiteman's influence on jazz, and also the film's reception. Musician and pianist Michael Feinstein (19 min.) talks about his love for Whiteman's work and provides more information about the other musicians in the film. Authors/archivists James Layton and David Pierce recently published a book about “King of Jazz” covering its production through its recent restoration. In four separate short video essays (42 min. total) they touch on different issues surrounding the film. We also get an extra short gallery of images of composer James Dietrich's notations on the musical score. Four Deleted Scenes have been included – these were restored for the film's 1933 theatrical re-release but aren't part of the original 1930 film and thus not included in the feature here. “All Americans” is a 1929 short film (19 min.) presenting an earlier version of the “Melting Pot” routine that ends the feature, also directed by John Murray Anderson. “I Know Everybody and Everybody's Racket” (1933, 21 min.) is an oddball short from Universal starring... Walter Winchell? The Broadway gossip columnist is presented hard at “work” trying to pick up juicy new tidbits at the Biltmore Nightclub in New York, where the Paul Whiteman orchestra happens to be playing. Bizarrely, Winchell is portrayed as something pretty close to a collaborator with mobsters and seems to have no problem with it. This short is surprisingly entertaining. An early sequence in “King of Jazz” features a cartoon showing how Whiteman became “King of Jazz” (its point and relevance escapes me, however). Criterion has decided to include two Oswald the Lucky Rabbit cartoons as final supplements, one of which co-stars an animated Paul Whiteman, and the other includes animation from the film. They run 13 min. total. The insert booklet features an essay by critic Farran Smith Nehme. “King of Jazz” was a flop when it was released in 1930, but it has survived as a fan favorite more than eighty years later. This Criterion Blu-ray presents the film with a restored print showing off the glorious Technicolor and a vast array of extras more comprehensive than any of the film's fans could possibly have expected.